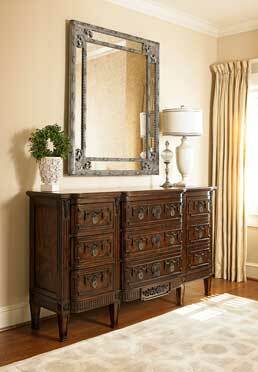 The beautiful piece has 9 drawers embellished with graceful woodwork and hardware. The style of this chest is very popular, with custom hardware influenced by items in the Louis XVl Room and the garland design on the fireplace in the Raphael Room in Biltmore House. It was also designed to pay tribute to the feminine side of Biltmore, influenced by Edith Vanderbilt's taste.